Happy mood right from the start as we wait for our shuttle bus, but at the wrong corner! Luckily we walked to the other side of this shop just before 8am and found the bus waiting for us! 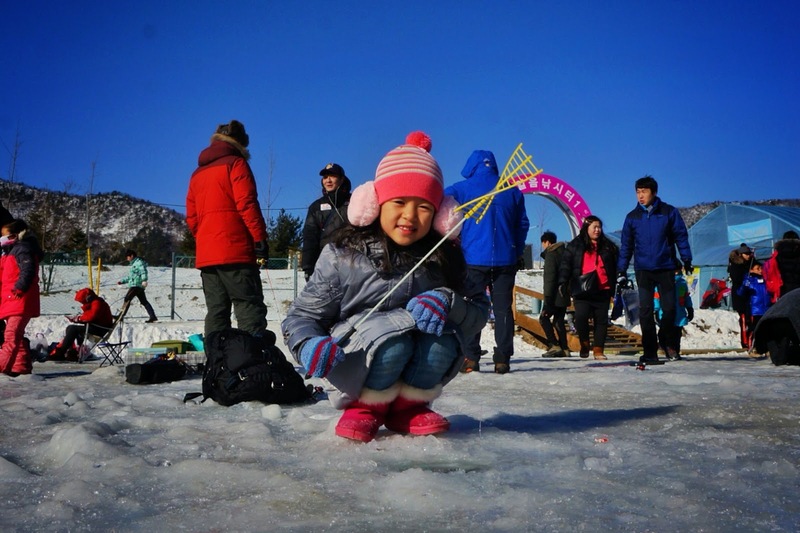 If there was one thing that I would really like to do during our recent trip to Seoul, it was to try out ice-fishing together with my daughter. And to make sure that I really get to do that, I did some online research even before flying over to Korea, and found the easiest way (and cheapest too) for me to get to the heart of all the action, Hwacheon-Gun, Gangwon-Do. 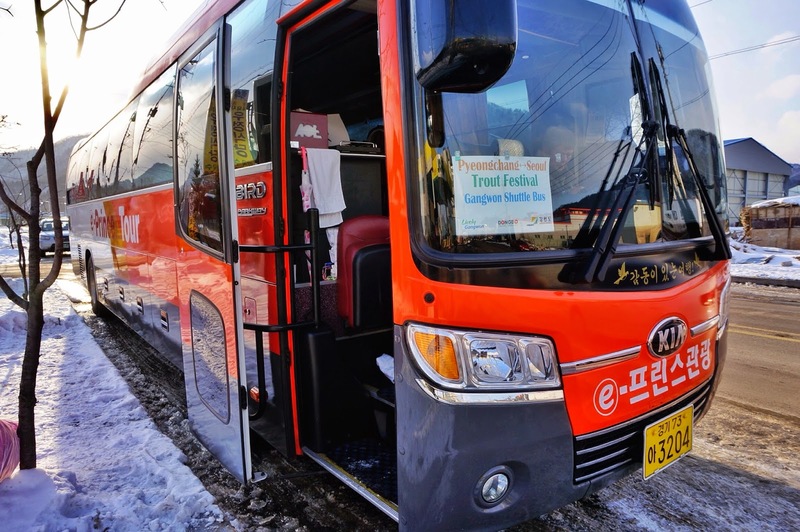 Apparently to encourage more tourists to the area, Gangwon Province is running a heavily discounted shuttle bus service between Seoul and Gangwon at only 5,000won per pax for a return trip. Check out their website for their bus schedule and online bookings. This is where we stopped for our 15mins toilet break. 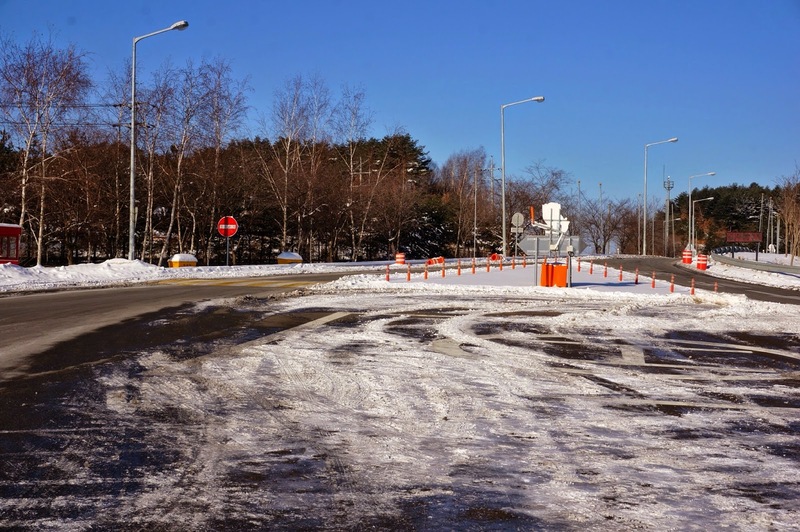 The weather was extremely cold and the roads were slippery! But scenery was really nice! We had to get up really early to ensure that we get to the meeting point at Gwanghwamun Square on time. 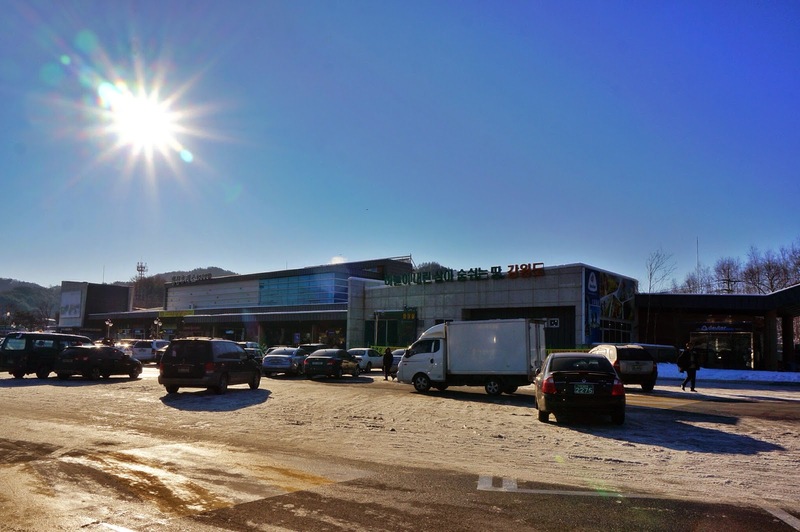 It takes more than 2hrs for us to get to Gangwon-Do, with only a toilet break in between. It was almost like a JB trip from Singapore, with a Yong Peng stopover. The scenery was absolutely beautiful, especially for me, who had never ever seen snow. But I must say we weren’t that well prepared for the extreme cold weather. 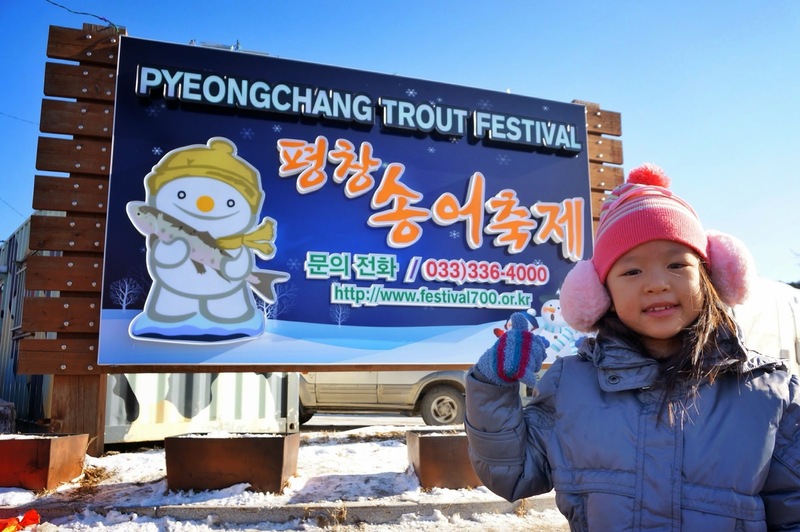 It was already over 11am when we got to Pyeongchang Trout Festival site, and we were really excited to start fishing! But first, we had to decide on what type of fishing we would want. 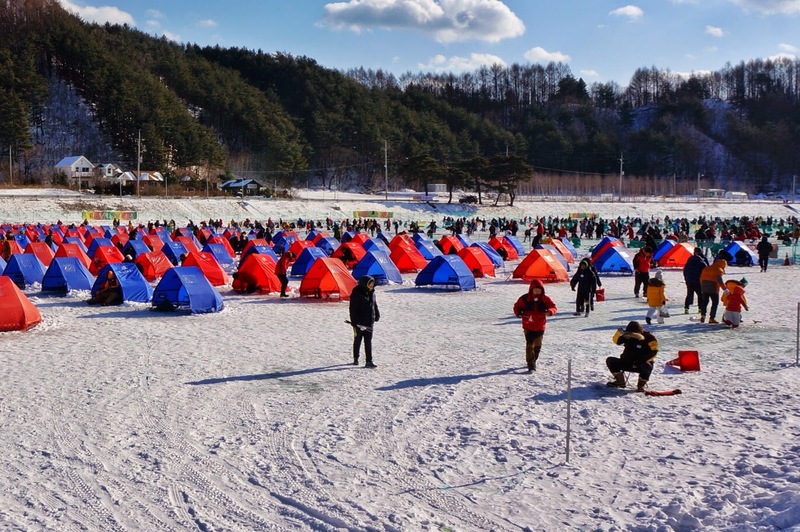 One can either opt for the open ice-fishing at 13,000won with absolutely no protection from the cold winter winds, or do a tent-fishing at 20,000won. 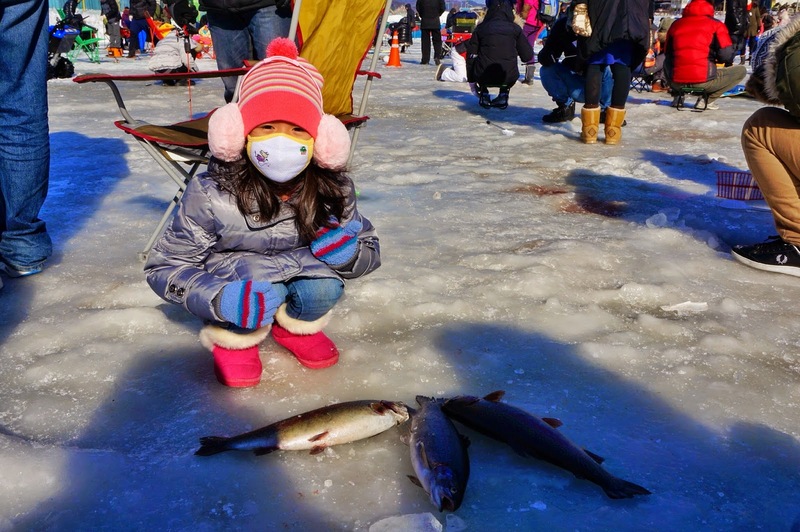 And lastly, there was even bare-handed fish catching at 20,000won as well, but I am not even going to think about that after experiencing the COLD! You might think what's the big deal about those tents, but when the wind really blows, you would wish you had one! Here's where all the other fishermen fish, out there in the open and exposed to the full elements. We chose the tent-fishing but as luck have it, the tickets were all sold out! 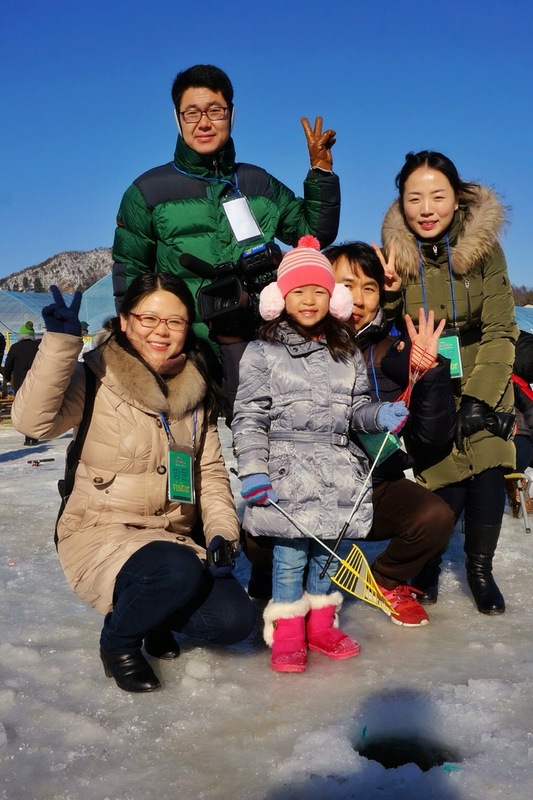 We thus have to settle with the normal ice-fishing and proceeded to get our rods, which were priced at 3,000won and 6,000won each, depending on the type of artificial bait attached to the line. These were the cheapest rods, and there were of course, lots of more “advanced” gear for the fishing enthusiasts. I took Steffi’s hands and went straight for the nearest “hole in the ice” for the start of our "chilling" out. Steffi even scored an interview with their local mandarin television station! The holding area just before the entrance to the fishing ground. Where food and drinks were sold as well. And here's the entrance to the fishing ground! 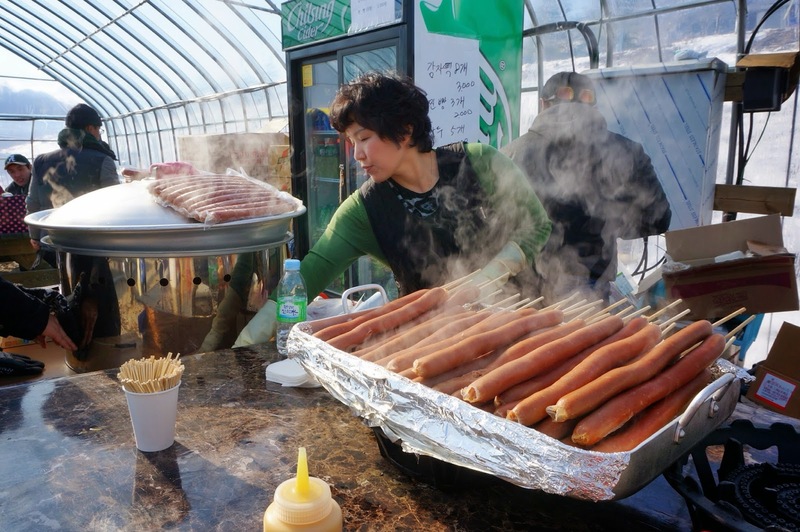 Children's favorite, huge hot dogs. 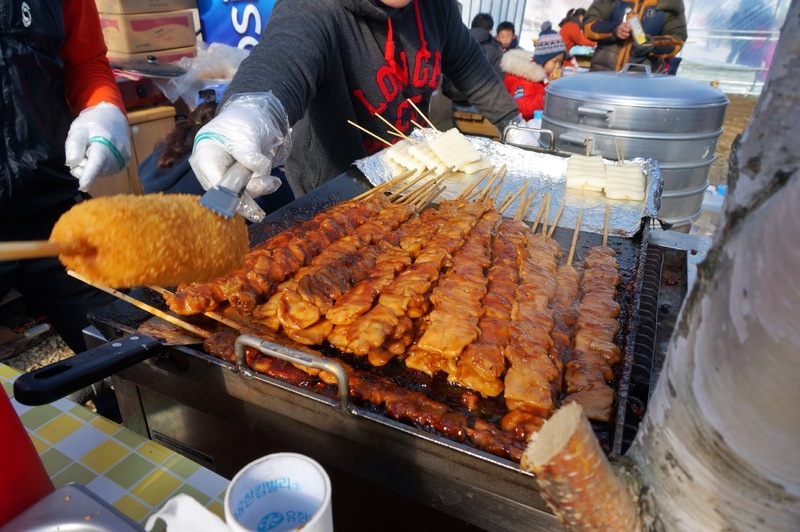 Chicken skewers in sweet sauce and breaded dog. Steffi enjoying one in-between our fishing. This is how the fishing hole looks like. Woohoo! We settled into the first empty hole we chanced upon. Steffi started playing the fool already. Steffi with a group photo with the television crew! There were people catching fishes intermittently around us during our 2 hours of moving our arms up and down trying to entice the trout to bite the artificial bait. But we didn’t had much luck and Steffi got a little bored and started to play with ice and snow instead. 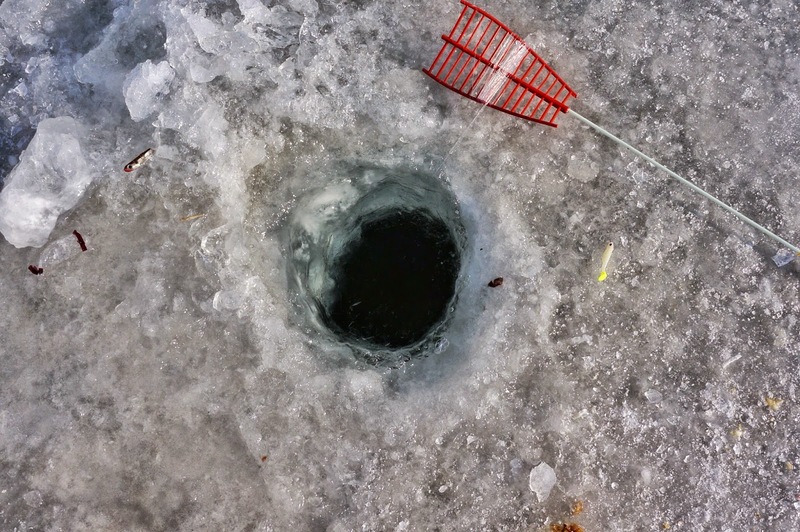 It was so cold that ice formed on our fishing lines even as we move it up and down the hole and my hand would go numb in about 5 seconds after removing the glove to text or reply messages! Steffi with some of the trouts that the other fishermen caught. Before we got here, I never thought about where exactly all the trouts came from but when we didn’t catch any, I decided to snoop around and find out. We came across a truck that was transporting fishes to the river and realized that we had chance upon the holding area for ALL the trouts. 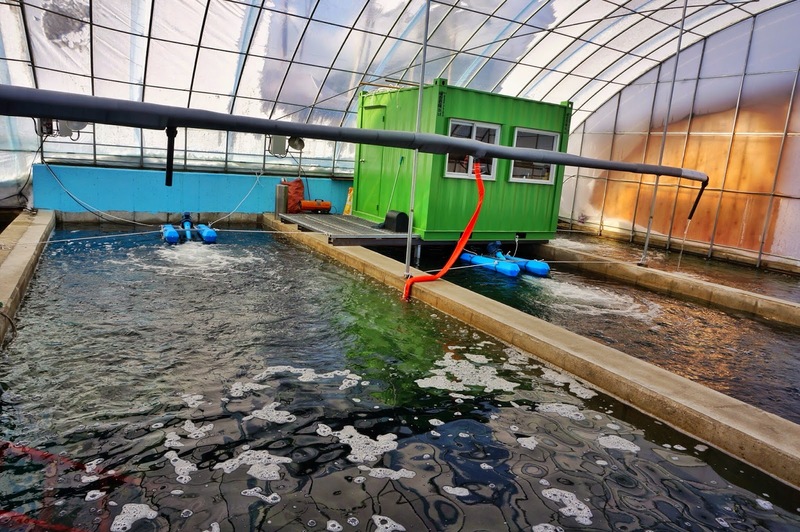 Steffi was even given access into the area and we saw lots of fishes in the tanks! 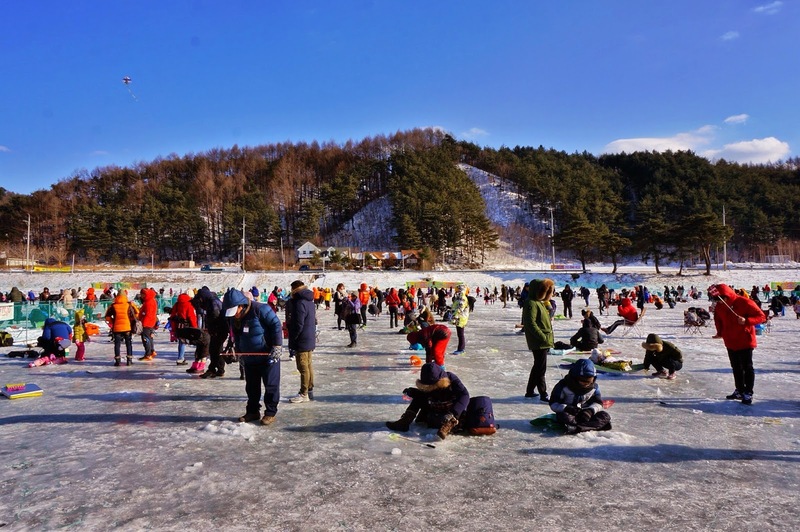 So now it dawned on me that fishing at the trout festival was really much like fishing at Pasir Ris fishing pond, except that the surface was frozen in the former! There were also regular replenishment of fishes into the river so that more people get the chance for a hookup. Here's the tractor that was transporting fishes down to the river, for us to catch! Steffi was given a tour of the holding area of all the trouts! And in these holding tanks were ALL the trouts meant for the fishing festival! So what do the people do to their catches? 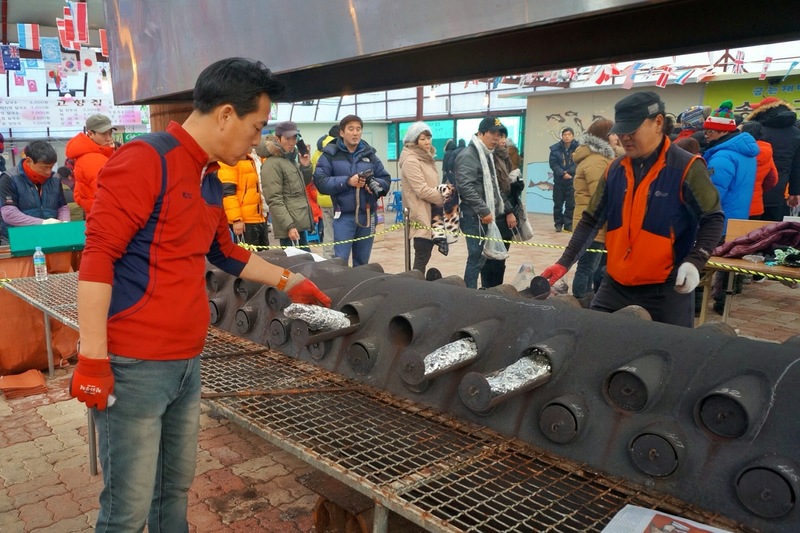 One can either get the fish processed raw as sashimi, or get it grilled the traditional way over firewood by the professionals. I didn’t manage to find out how much the services would have cost, for we didn’t catch any fishes but we do know that half a portion of sashimi cost 10,000won while the grilled fish cost 20,000won. We tried the sashimi and although the flesh looks (and tastes) like salmon, the texture was much more chewy than our regular salmon. 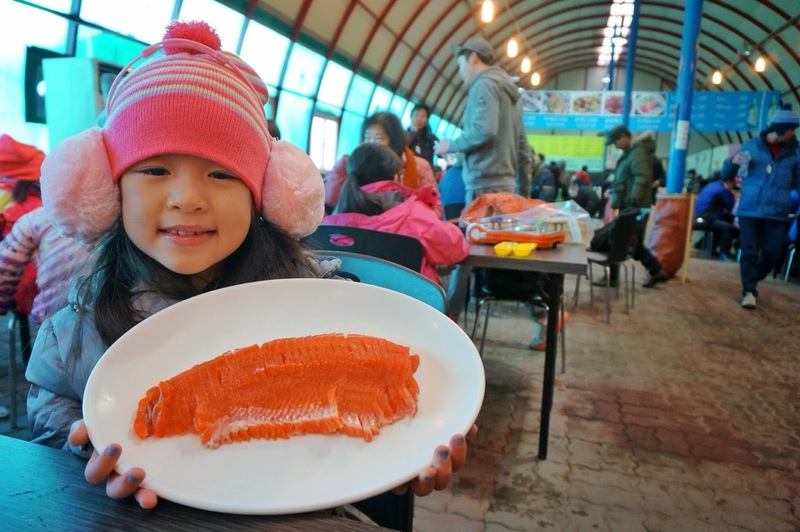 Considering that this is a freshwater trout, the flesh is indeed nice and of course it was really fresh too. 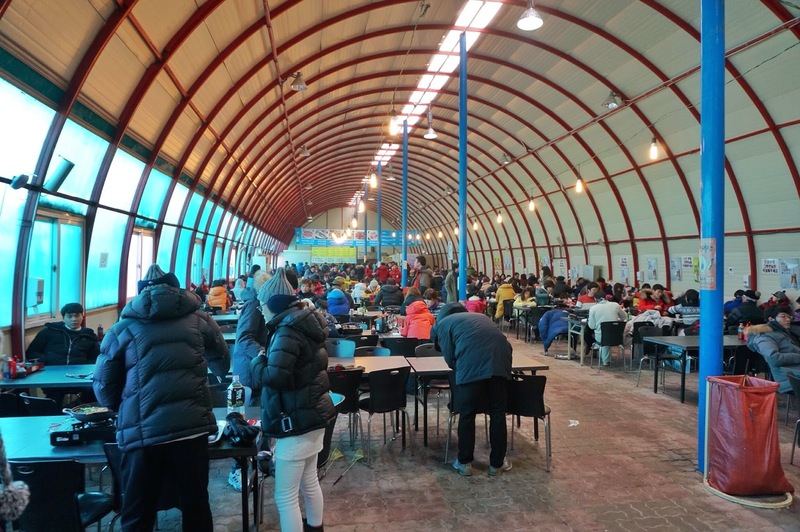 This "foodcourt" is where one can purchase wonderfully delicious trout sashimi if one fails to catch any. Steffi with our 10,000won worth! Yummy! Here is where one can get their prized catch grilled to perfection by the experts. Steffi with the firework used for the grilling. 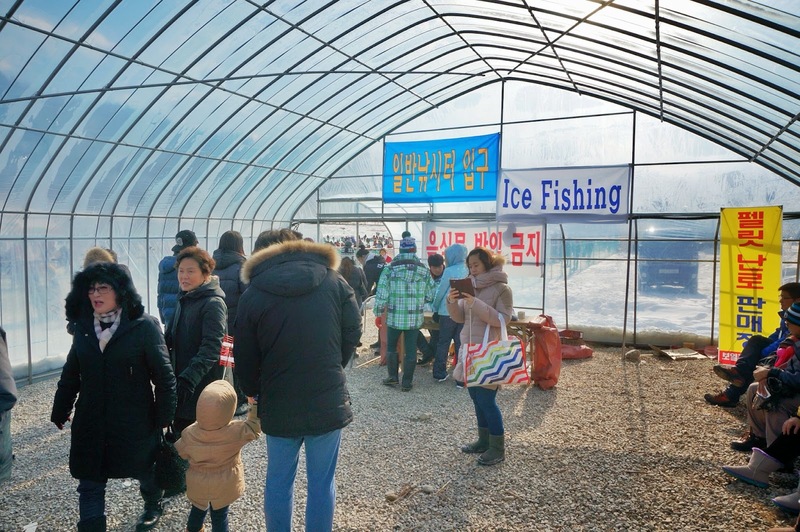 Whole fishes are sold at 20,000won a piece. A great place to hide from the cold weather and to keep the tummy filled. With our lack of luck (and skills) in fishing, we decided to call it a day and went walking around the entire area. 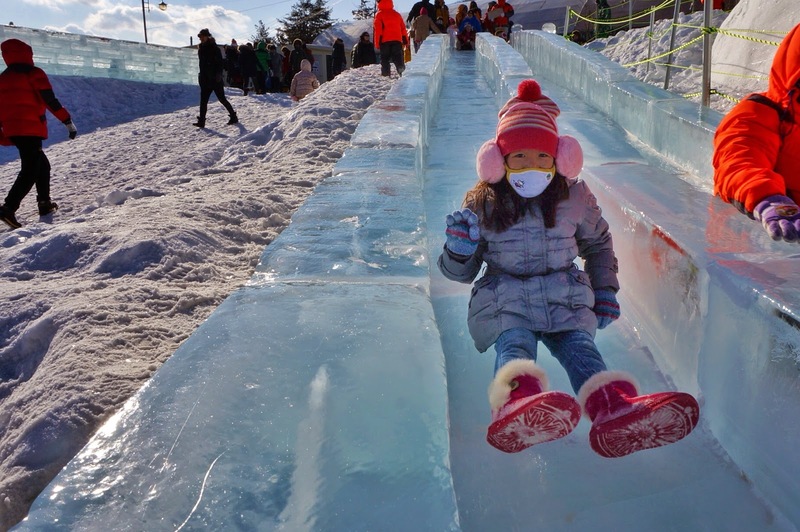 There were slides made of ice blocks for the kiddos, as well as ice-sculptures scattered around the festival area. 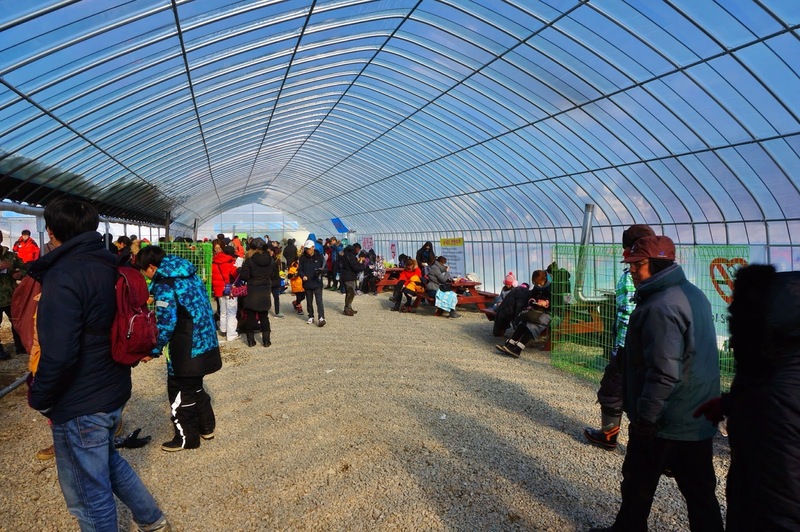 One would need to purchase tickets for the individual rides, or for entry into the ice-sledge or snow-tubing area. 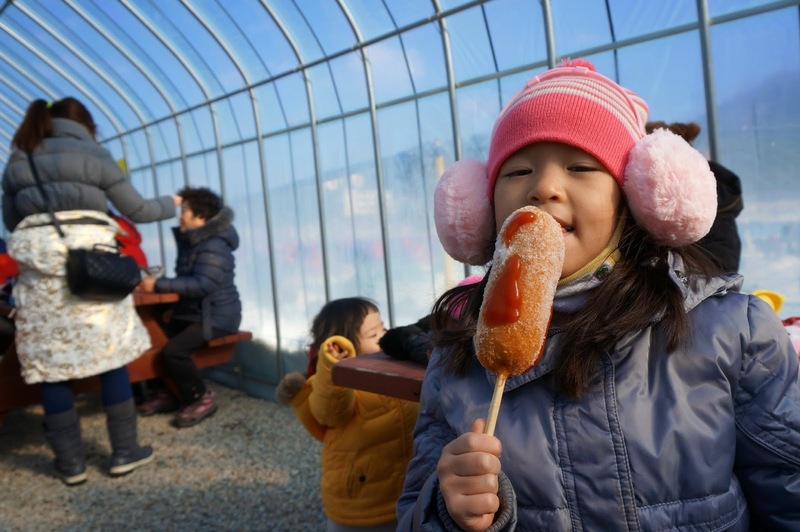 It would be a great place for little kiddos who like to experience the ice and snow play but unfortunately for us on a day trip, we do not have the luxury of time. We only had around 4 hours of actual play time before we need to board the bus for our trip back to Seoul. 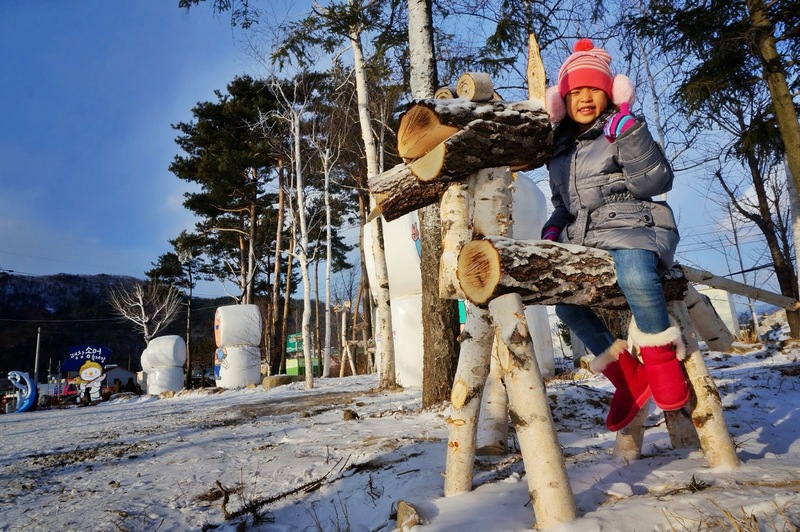 Now that I know exactly what to expect, the next trip with the entire family would be better planned, with perhaps a night or two stay over at Gangwon, with perhaps snow-skiing at nearby resorts thrown in as well. 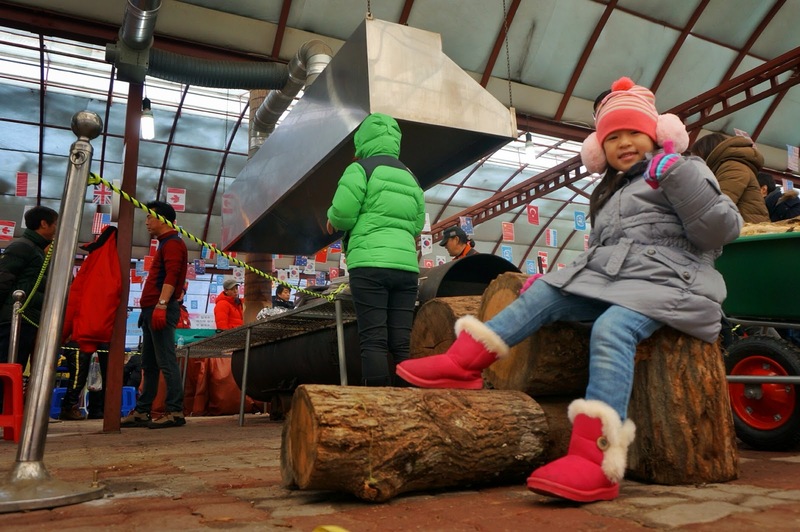 We walked around the festival ground and took in the wonderful but cold atmosphere. Steffi trying out the free rides. 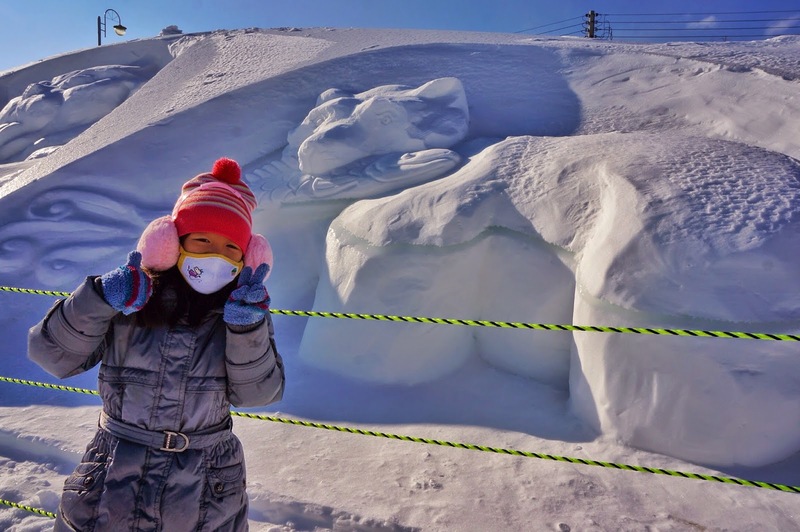 There were also snow sculptures everywhere. 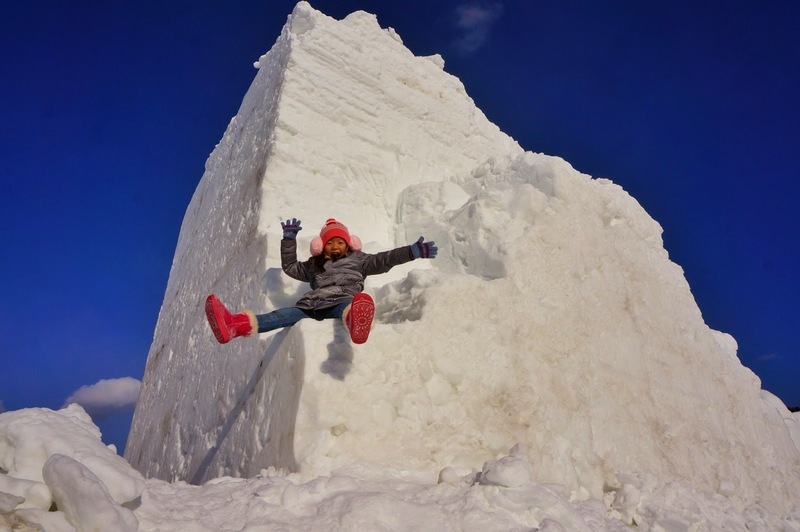 Steffi posing on one of the block of ice. Steffi would have loved to try out the snow-tubing but we were really running out of time. 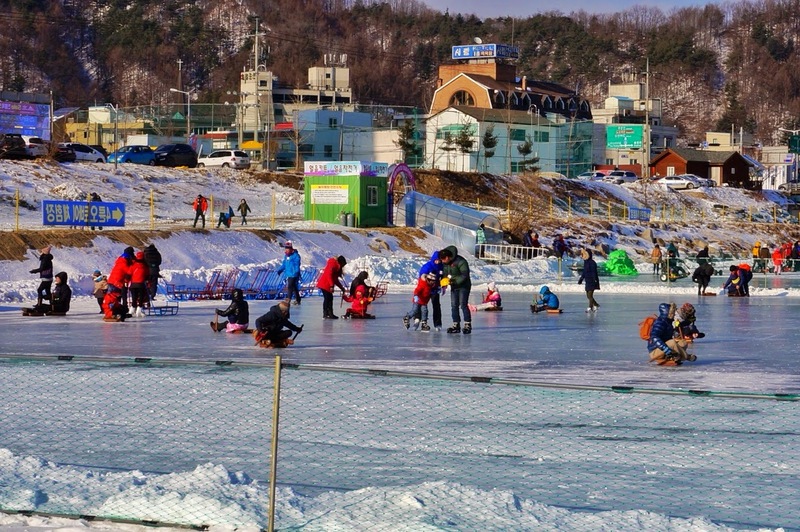 Here is one section of the river used for ice-sledging the traditional Korean way. Until next time, it’s back to warm and rainy Singapore for now, but the memories of our first snow and ice-fishing encounter will forever be etched in our minds. A wonderful bonding trip between father and daughter. I hope Steffi enjoyed the trip as much as I did with her around. 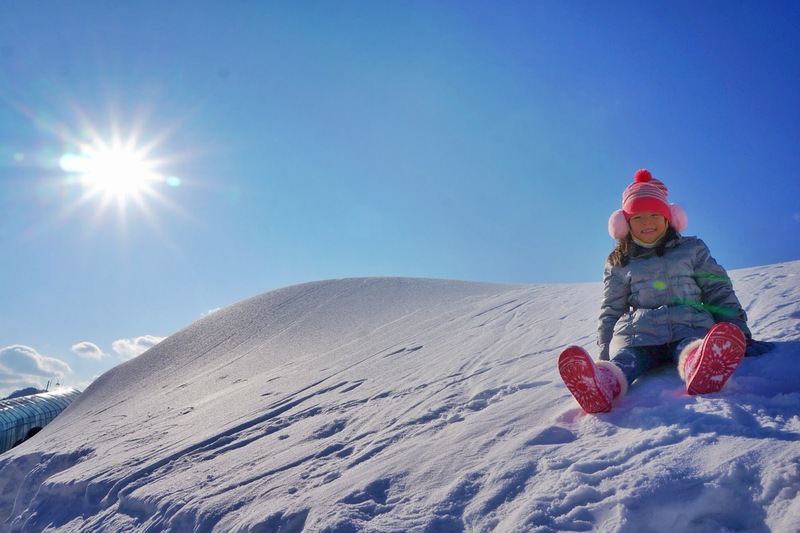 We simply loved the snow and the entire atmosphere. Aww... after only around 4hrs at the place, we had to board the bus for our return trip back to Seoul. 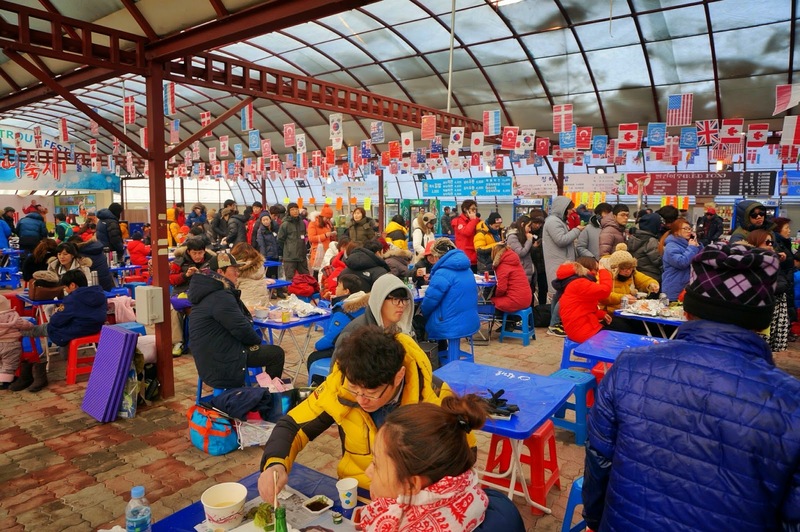 If you happen to be in Seoul from now till 08 February, you might want to consider a day trip to the Pyeongchang Trout Festival, with the cheapest and fuss free transport option by booking online here. 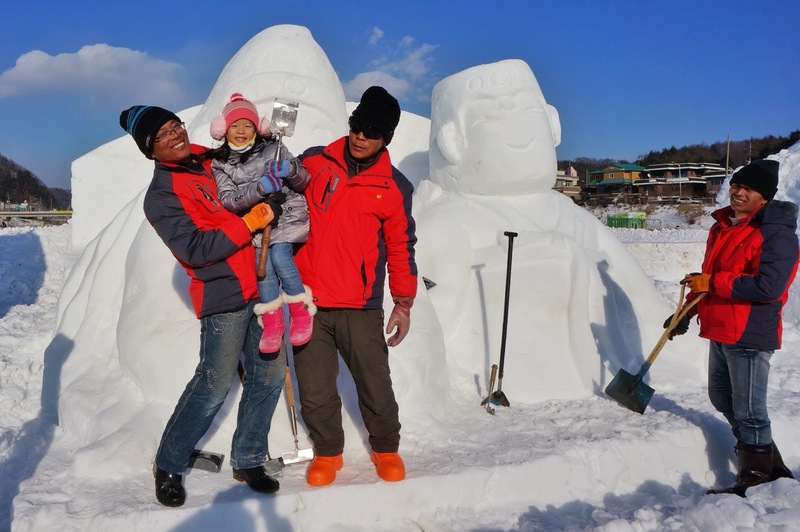 There is also a Hwacheon Sancheoneo Ice Festival from 10 Jan - 01 Feb 2015 that may be nice too! Have fun everyone! Hey thanks Brandon! I don't know how long it would take exactly but from what I gathered, both options should take about the same time, 2hrs plus. 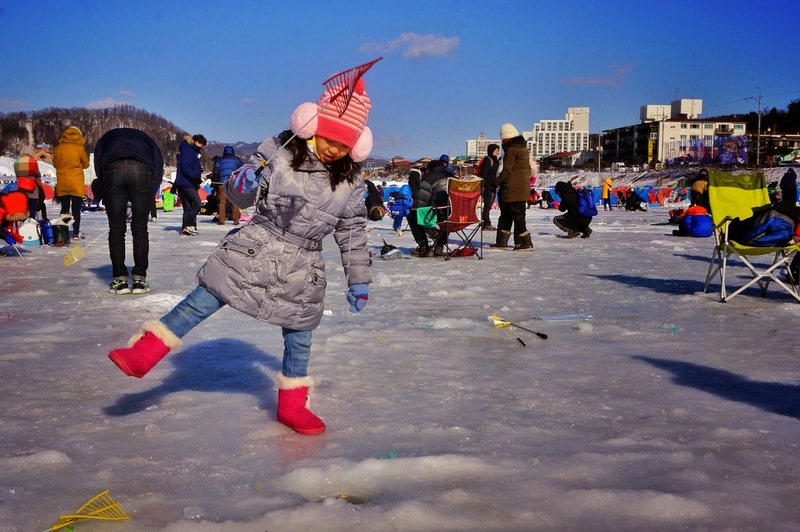 :) You might want to consider Hwacheon Sancheoneo Ice Festival instead? Seems like chances of getting a fish is much higher! But no matter what, you should try it at either one of the locations and remember your heat packs! Have fun!!! Love her ear muffs, so cute! I wonder when I can bring my children to such cold places, they can't stand coldness. This will be the kind of holiday that my hubs would totally dig!! I should show it to him! He's already planning a father-daughter trip and totally leaving me out of the equation. Sobs! OMG! I found myself laughing when I read that the trouts were released into the river for everyone to fish. Hahaha so hilarious when I thought that its a nature activity! What an interesting experience you had with Steffi. 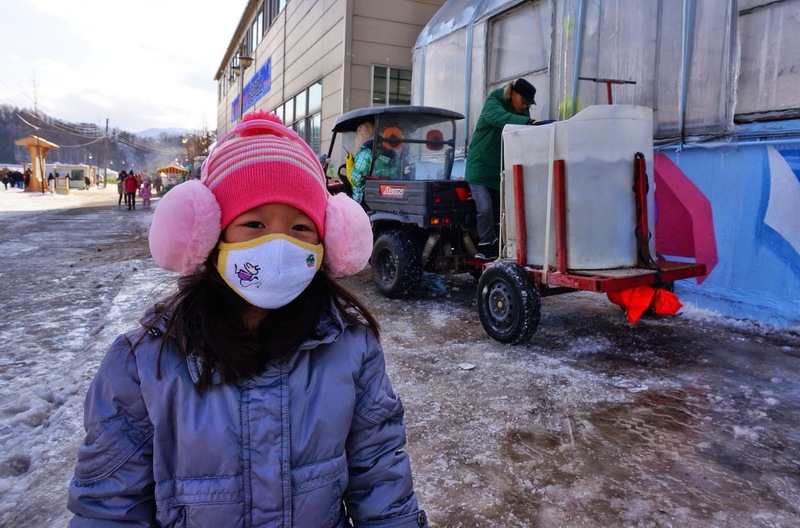 I'm sure she must have very fond memories of finishing with daddy in winter in Korea. What a fun, fun trip Steffi has with you! 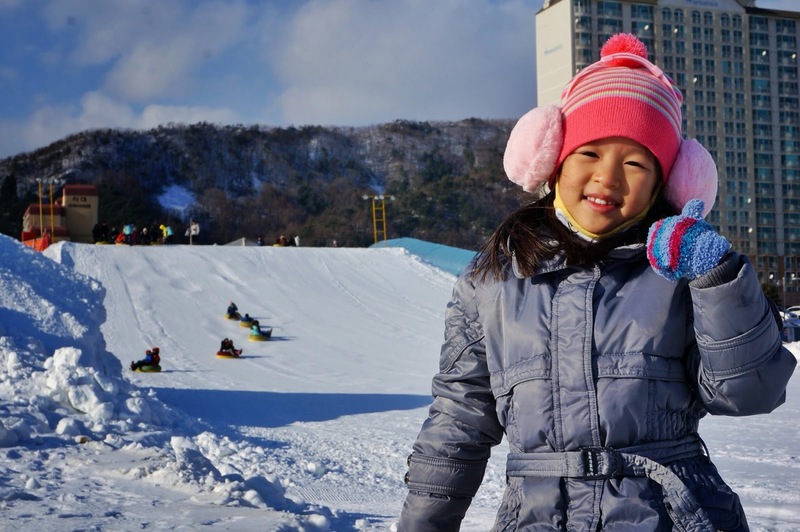 This is one activity I will definitely plan for my kids to try if we ever make it to Korea. Emicakes - Log Cake Giveaway!